Malaria has confounded biomedical researchers for decades because it’s been impossible so far to develop a vaccine that offers a high level of protection. But, thanks to a different approach to vaccine design and delivery, there’s hope that we may have finally turned the corner in the fight against this mosquito-borne health threat. Until recently, the best that medical research could do was a candidate vaccine (with the unusual name RTS,S) that provided protection against malaria to about 22 percent of recipients. Now, 22 percent is a lot better than zero, demonstrating that a vaccine strategy could work. But obviously a higher level of protection is needed, especially when you consider that malaria sickens about 220 million people around the world each year—claiming nearly 2,000 lives a day, many of them children . And, because malaria is becoming resistant to the complex combinations of drugs now used to treat it, the need for an effective vaccine is greater than ever. 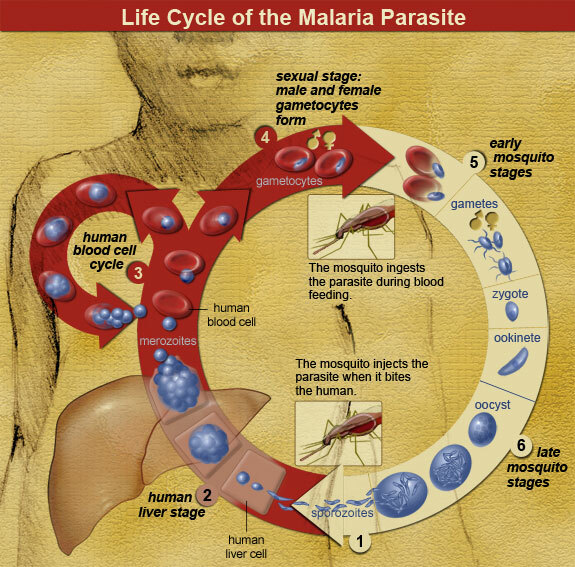 The cause of the deadliest form of malaria is the microscopic parasite Plasmodium falciparum, which lives in the salivary glands of mosquitoes during part of its life cycle. When a mosquito bites, it transfers the disease-causing organism through its saliva. While many researchers have tried using various proteins from P. falciparum to trigger a protective immune response, researchers from NIH, the Army, and the Navy recently decided to test something different: a vaccine made from the entire parasite. In a study described in the journal Science , the research team gave the PfSPZ Vaccine, developed by Sanaria of Rockville, MD., to a small group of human volunteers at the NIH Clinical Center here in Bethesda, MD. Production of the vaccine was a technical tour de force that involved raising mosquitoes infected with P. falciparum in the lab, radiating the insects, and then removing their salivary glands to harvest billions of radiation-weakened parasites . The vaccine made from these whole parasites, which are so weak that they cannot cause disease, was then injected directly into the blood stream of volunteers. Although this was an early-stage trial with very small numbers of participants, the results are promising because they may provide evidence that it’s possible to create a vaccine that offers 100 percent protection. That’s not to say there aren’t significant hurdles to clear before we can even think of using the vaccine in real-world settings. First, we need to determine how long the vaccine’s protection lasts. Then, there are serious concerns over cost of producing, storing, and administering a vaccine of this kind, especially in developing nations. Not only is the PfSPZ Vaccine difficult to make and scale up, it must be kept frozen in liquid nitrogen. It also must be injected into the blood stream multiple times, which is more expensive and demanding of skilled personnel than other routes of vaccine delivery; a preventative vaccine has never been delivered this way. However, previous tests in which lower doses of the PfSPZ Vaccine were injected into or under the skin provided minimal protection. The next clinical trials, which will take place in Tanzania, Mali, and Equatorial Guinea, will involve more participants and a longer follow-up. If all goes well, we may be on a path for an effective vaccine in the next 5 – 10 years. While there are many hurdles, this new report has to be considered good news indeed for people all around the world. Protection Against Malaria by Intravenous Immunization with a Nonreplicating Sporozoite Vaccine. Seder RA et al. ; the VRC 312 Study Team. Science. 2013 Aug 8. Development of a metabolically active, non-replicating sporozoite vaccine to prevent Plasmodium falciparum malaria. Hoffman SL et al. Hum Vaccin. 2010 Jan;6(1):97-106. Epub 2010 Jan 21. Review.